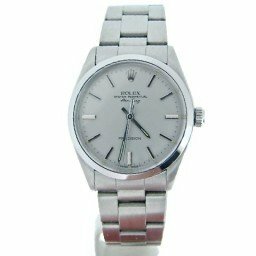 Our selection of Rolex Air King Mens Stainless Steel watches have a smooth and clean look. 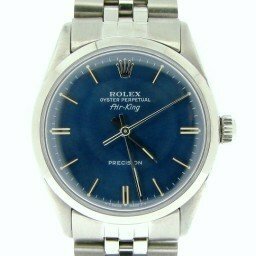 This Rolex is a great starter watch because of its design, its quality, its rich history, and its affordable price. 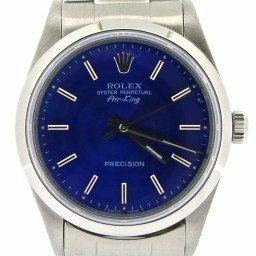 These mens stainless steel Air Kings are size 34mm with colorful dials and a variety of bezels. 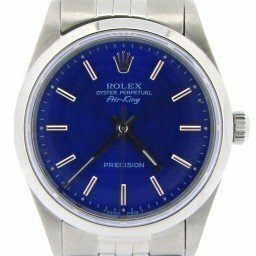 Browse our entire collection for the best Rolex price. 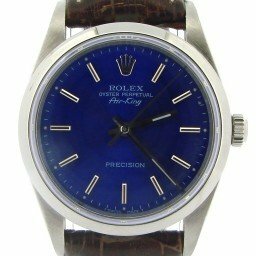 This watch is a solid choice that can last for generations. 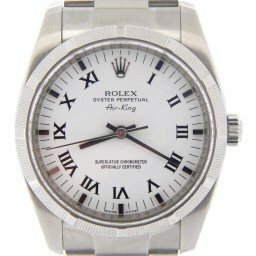 Keep in mind, we offer a 30-day money-back guarantee with each purchase and a one year warranty on most watches. 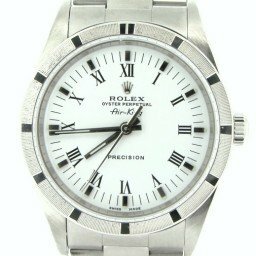 In addition, we offer after-sales support and a Lifetime TradeUp Guarantee on qualified items. 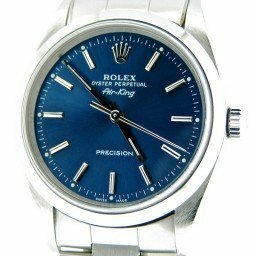 This means, you can come back to us when you want to upgrade to another model. 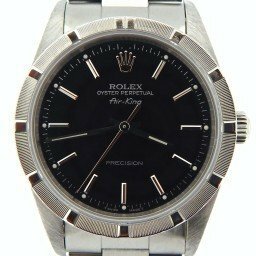 And, don’t forget our personalized customer service strives to deliver 100% satisfaction for all of our customers. 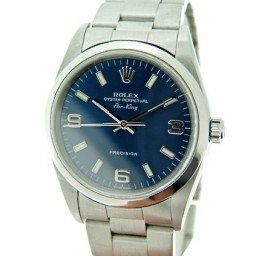 So, please let us know if we can assist you. 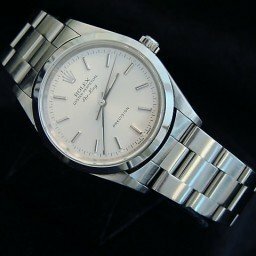 For those who are venturing out into the big wide world of luxury watches, a question that comes up very often is what’s the best first Rolex to invest in. 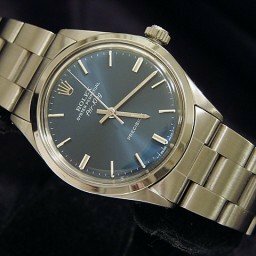 There are a few common traits that new buyers tend to look for in the first Rolex they buy. 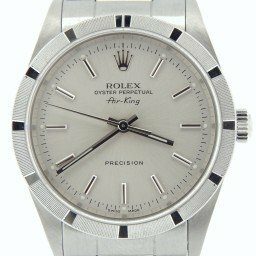 Design recognition, quality, history, and accessible price point are all top factors to consider. 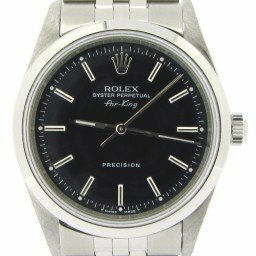 And in our opinion, the stainless steel Air King checks off all these boxes, thus, making it a great contender as a starter Rolex—particularly for younger consumers. 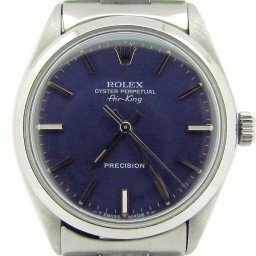 For the purposes of this article, we’ll be focusing on older and discontinued stainless steel Air King models rather than the brand new one. 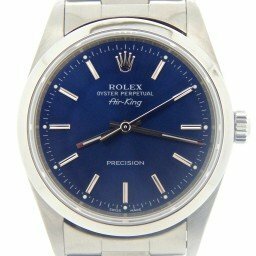 This is simply because the new Air King ref. 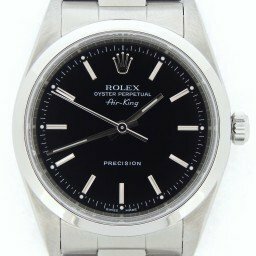 116900 is nothing like preceding models. 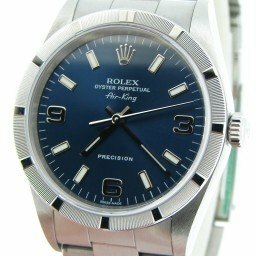 Let’s dive into four reasons why the Rolex Air King mens stainless steel model is a great starter Rolex. 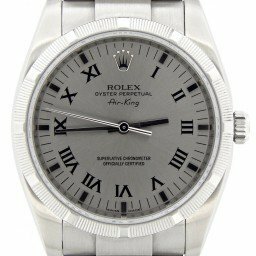 In terms of design, the stainless steel Air King is straightforward and immediately recognizable as a Rolex watch. 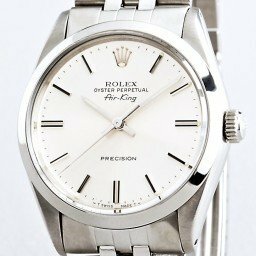 It sports a restrained 34mm case, the three center hands on the dial, and the iconic Rolex logo, coronet, and “Air King” label just below 12 o’clock. 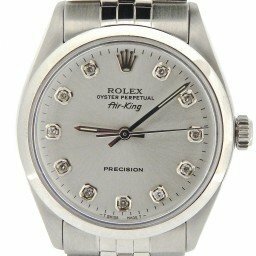 While it may be minimal, the stainless steel Air King line is most definitely not boring. 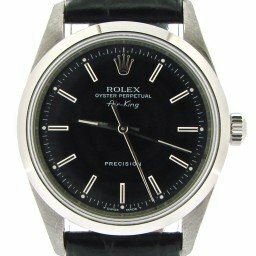 In fact, it’s a varied collection with plenty of design features to choose from. 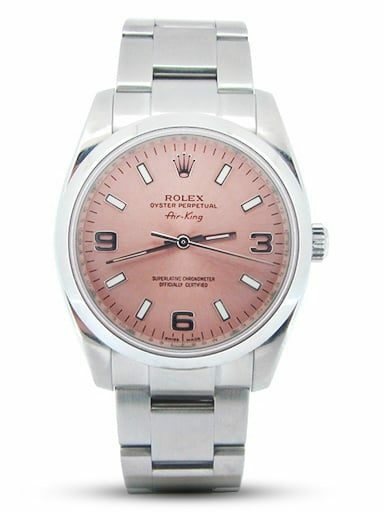 For instance, you can opt for a smooth bezel or the more intricate engine turned one. 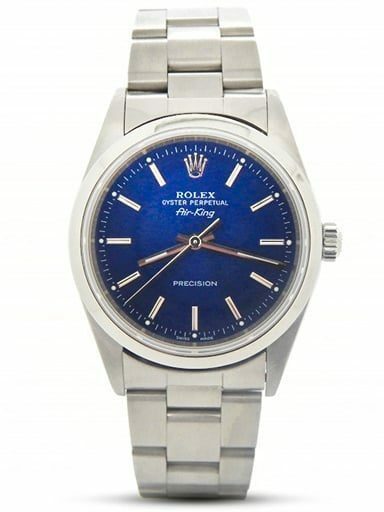 Plus, steel Air King watches come equipped with either a sporty Oyster bracelet or the dressier Jubilee bracelet. 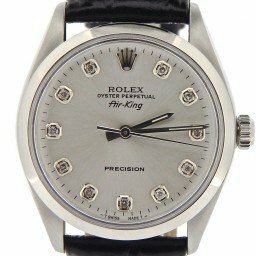 Furthermore, it is the dials of the stainless steel Air King watches that offer the most diverse options. 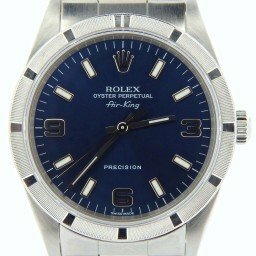 There’s a slew of colors, materials, and numeral options to contemplate over. 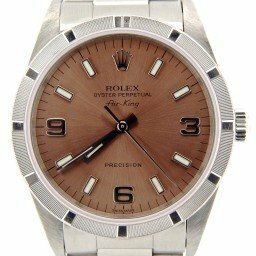 Since this is a Rolex watch we’re talking about, the quality of the Air King is irrefutable. 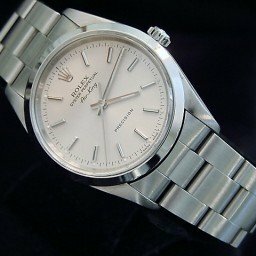 From its in-house Rolex automatic movement beating within to its superb overall craftsmanship, no one can deny the incredible attention to detail that Rolex gives to all their watches. 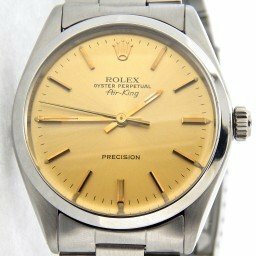 Naturally, since Rolex are constantly improving and enhancing their models throughout the years, details differ between vintage models and newer ones. 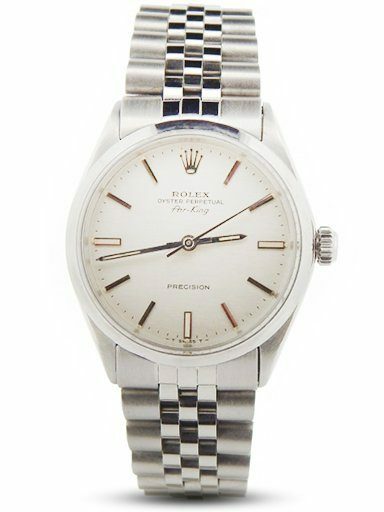 For example, while stainless steel Air King ref. 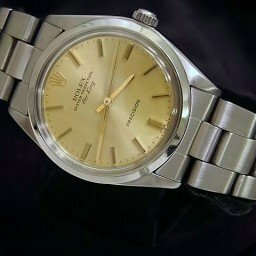 5500 and ref. 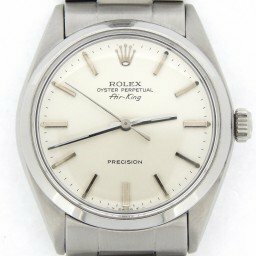 14000 included “Precision” or “Super Precision” on the dial, later models such as the ref. 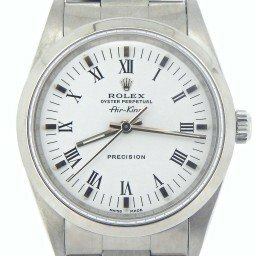 114200 boasted the “Superlative Chronometer Officially Certified” label since they were now COSC-certified. 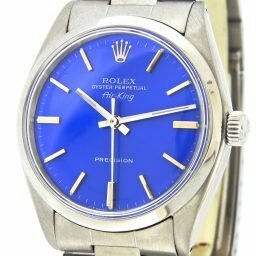 One of the draws of wearing a Rolex—especially for watch enthusiasts—is the story behind the watch. 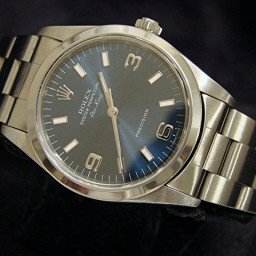 How the watch came to be created, some highlights throughout the years, and if it’s still around or not are great tidbits to start a long and passionate watch-centric conversation. 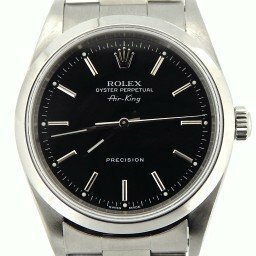 And the Rolex Air King has a long and interesting history indeed. 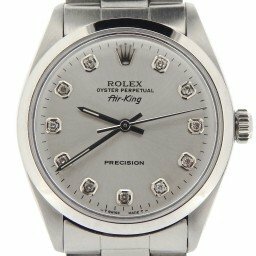 In fact, it’s one of the longest running collections of the Swiss watchmaking giant still in production today. 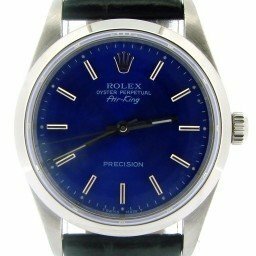 Created in 1945 by Rolex founder, Hans Wilsdorf, the Air King was a tribute to the bravery of the British Royal Air Force pilots during World War II. 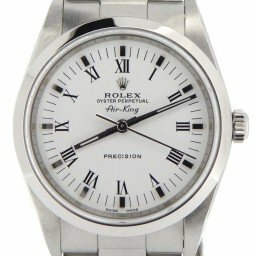 While it had a brief two-year production pause in 2014, Rolex brought back the fighter pilot tribute timepiece in 2016.  That’s a story that spans over seven decades! 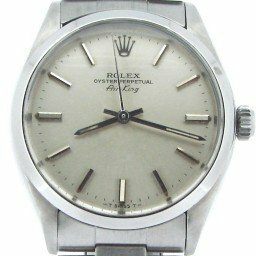 Longer than more famous models like the Submariner, Daytona, Day Date, and GMT Master. 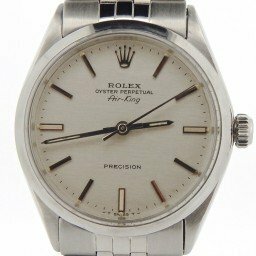 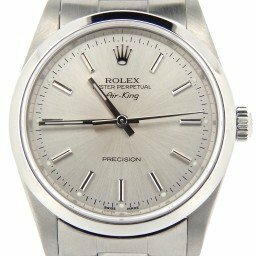 Perhaps the most attractive point about an Air King as a first Rolex is its affordable price (for a luxury watch). 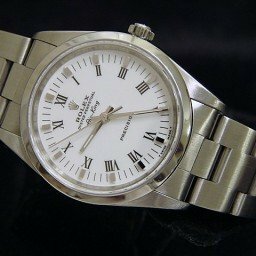 A pre-owned stainless steel Air King can be picked up for less than $2,500. 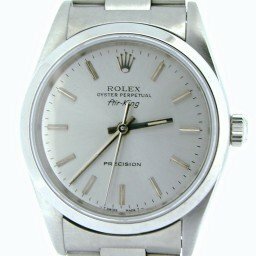 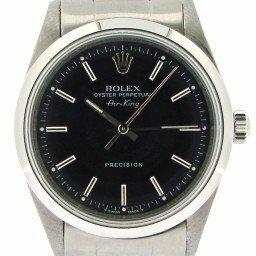 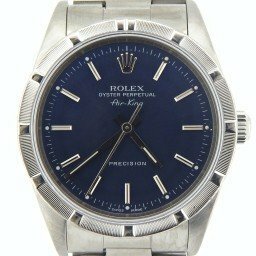 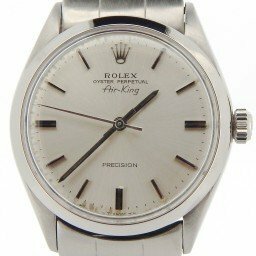 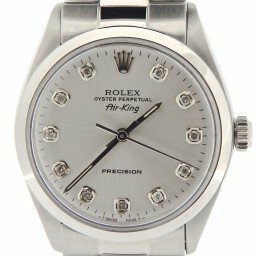 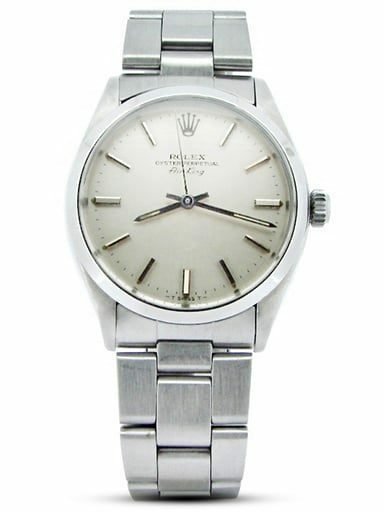 However, the median price range for a stainless steel Rolex Air King in the secondary market is about $3,000 to $4,000. 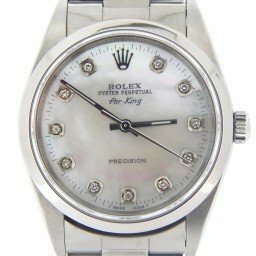 That’s an absolute bargain for a Rolex watch that will last you forever! 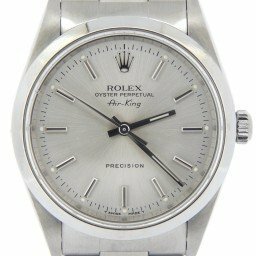 So if you’ve gained a newfound interest, or want to buy pre owned Rolex, or want to share your passion with a younger generation, it’s clear that the stainless steel Air King is a solid choice as a first Rolex watch. 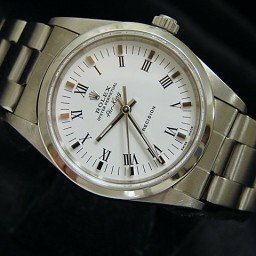 And, you can view a great selection of these models…and more…here at BeckerTime.